Prepare with the only official study guide for the CWNA-106 The CWNA: Certified Wireless Network Administrator Official Study Guide: Exam CWNA-106 is the officially endorsed CWNA test prep for the leading wireless certification. Expert authors and CWNEs David D. Coleman and David A. Westcott guide readers through the skills and concepts candidates need to know for the exam, using hands-on methods to convey an in-depth understanding of wireless network administration. Readers should have a basic knowledge of Radio Frequency behavior, experience with WLAN hardware peripherals and protocols, and an interest in designing, installing, and managing wireless networks. Wireless technology is taking over the tech industry, and the demand for competent, certified professionals is far outpacing the supply. A CWNA certification denotes advanced-level proficiency in the field, with a complete understanding of wireless LAN components, features, and function but the only way to pass the exam is to truly understand the material, not just the talking points. The CWNA: Certified Wireless Network Administrator Official Study Guide thoroughly covers each exam objective, and includes review questions, assessment tests, and exercises to test your skills. Topics include: * Radio Frequency technologies, regulations, and standards *802.11 protocols * Network implementation and security *802.11 RF site surveying Readers also get access to a suite of study tools including an electronic test engine with hundreds or practice test questions, electronic flashcards, exercise peripherals, and industry White Papers, which serve as valuable backup references. 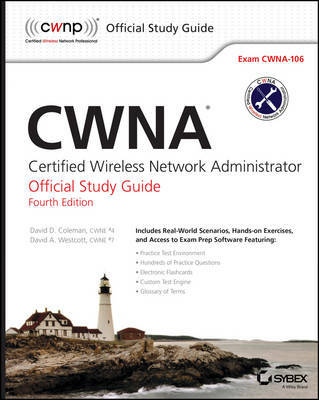 In preparing for the CWNA-106 exam, the ideal study guide should cover all of the exam topics in depth CWNA: Certified Wireless Network Administrator Official Study Guide does just that, making it an excellent, comprehensive study guide.